There is something about planting peas in the spring that announces to the world that winter is done and summer is not far behind. Here in Maine, getting the peas in on time assures us of new potatoes and peas for the Fourth of July. To do that, the peas need to be in the ground sometime in April. 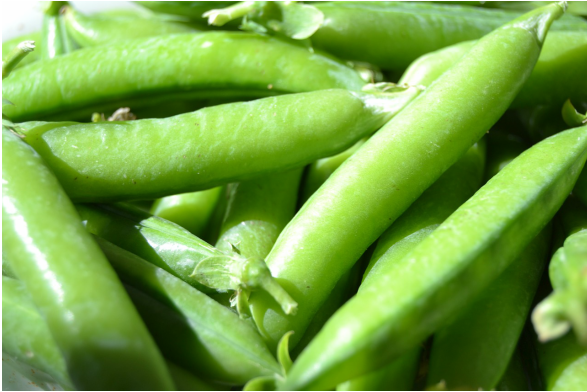 Garden peas may also be referred to as English peas or shelling peas. Preparing the Soil: Choose a location that receives full sun for 6 to 8 hours a day. Till the soil to a depth of 8 to 12 inches in the early spring as soon as the soil can be worked. Remove plant debris, roots and stones from the soil. Add a 2- to 3-inch layer of well-rotted manure or compost and work it into the top 6 inches of the soil. Apply 5-10-10 or 10-10-10 fertilizer following the application rate on the container. Work granular fertilizer into the soil well, as it will "burn" seeds and emerging seedlings if it comes in contact with them. Providing Support: Erect pea fences or trellises before planting your peas. The size of fence needed depends on the type of peas grown. Tall telephone peas require a sturdy 6-foot fence, while dwarf peas need an 18 to 24 inch fence or trellis. Preparing Pea Seeds for Planting: Place the pea seeds in a large bowl or bucket with about twice the volume of the seeds. Pour tepid water over the peas and allow them to sit overnight. As the dried pea seeds soak in water, they absorb moisture and swell to at least twice their size. This prepares the seeds for quick germination. Planting: Plant the pea seeds to a depth of 1-inch spaced 2 to 4 inches apart in rows 24 to 36 inches apart. Cover the seeds with soil and firm it down with the back of the hoe. I personally prefer to use my feet to gently firm the soil over the peas, but if you want to look a bit more professional in your garden, the back of the hoe works well, too. Side dressing: Side dress your peas with fertilizer when they are 2 to 4 inches high. Sprinkle a light band of 5-10-10 or 10-10-10 fertilizer along the row, about two inches from the plants. Work it into the top 2 inches of soil with a garden hoe. This provides a boost to your young pea plants without the risks of burning the seeds or roots by direct contact with fertilizer. Watering: Peas thrive in cool, moist soil and benefit from supplemental watering. Water deeply once or twice a week or whenever the soil feels dry 1 inch below the surface. Mulching: Mulch the base of peas with grass clippings or other organic mulch to maintain moisture and keep the soil cool. Mulch also provides a weed barrier. Weeding: Cut weeds that emerge through the mulch at their base to prevent disturbing the roots of peas. Peas have shallow roots and can easily be uprooted in attempts to pull large weeds among the peas. Some yellowed leaves at the base of your peas are unavoidable -- especially as the weather warms -- but if more than a leaf or two turns yellow, your peas need attention. Check the soil often and provide adequate water to keep your peas healthy.